This entry was posted in Uncategorized and tagged Accredited in Public Relations, APR, PRSA, PRSA Chicago, public relations, Public Relations profession. Bookmark the permalink. Congratulations Edward. I feel the same way, 21 years after earning my APR. It was a personal decision that affected my career in a very positive way and led me to serve in leadership positions with friends and colleagues like you. Those leadership positions taught me so much that I’ve applied to my every day practice of public relations management, and have led to a vast network. Hi Marisa: Sincere thanks for your thoughts. 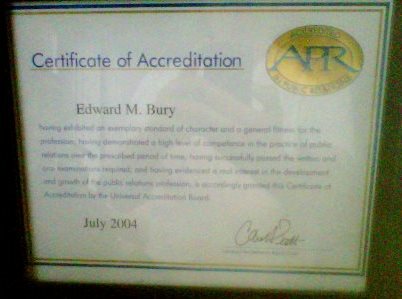 I had been in public relations and communications for years; but I truly elevated my career and skills through Accreditation. And, as noted, I’ve had the opportunity to serve the industry and have a role in shaping its future. This is great! I just returned from the UAB meeting in New York, and we talked about many of the same ideas you listed above. One of the best professional accomplishments that I’ve had is the APR. Thanks for your dedication to the APR credential and the public relations profession. I hope to see you soon! Thanks very much for your comment. Earning Accreditation and my time on the UAB proved to be a huge influence on my career. Wishing you and the UAB members much continued success. Sincere thanks for your comment and support. Society needs Accredited professionals now more than ever.